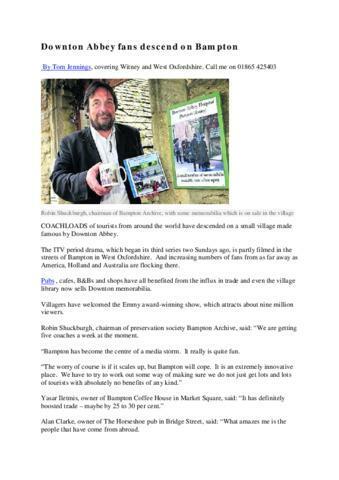 Robin Shuckburgh, chairman of the Bampton Community Archive, explains that many coaches a week are coming with tourists keen to see where the outside scenes of Downton Abbey are filmed. The church has been used for weddings, nearly weddings and Christenings, Church Gate House next to the church is the home of Mrs Crawley in the program and the old Grammar School is used as the Cottage Hospital. Other homes are used as pubs and the post office. Local pubs, B&Bs and the Coffee House have all benefited.